Below you will find links to archived articles and news of events related to Dignity Village and friends. For city's homeless, will it take a village? We won't stand for it! A home or a place to camp? "Subject to 24 hour notices?" But we pay rent! An entry which will soon appear in a dictionary of social movements. A letter to the editor says "Let them live", a response to "It takes a different village"
Ah, the kept press. They take money for our ads and slam us in their mean-spirited editorials. July 11, 2002 issue of Now magazine. July issue of New Connexion editorial. July issue of YM Magazine gives a mention of Dignity Village. Real Change calls us refugees. May 2002 issue of Architecture. Dignity is featured in terms of its amazing architecture. Willamette Week gets most of its facts right in New Digs for Dignity. Roving tent city can build on its legal foundation - Seattle becomes the first West Coast city to adopt a progressive policy towards its tentcity as Tent City III there becomes "legal." Vera's Deaf Ear -- "Are You Poor? 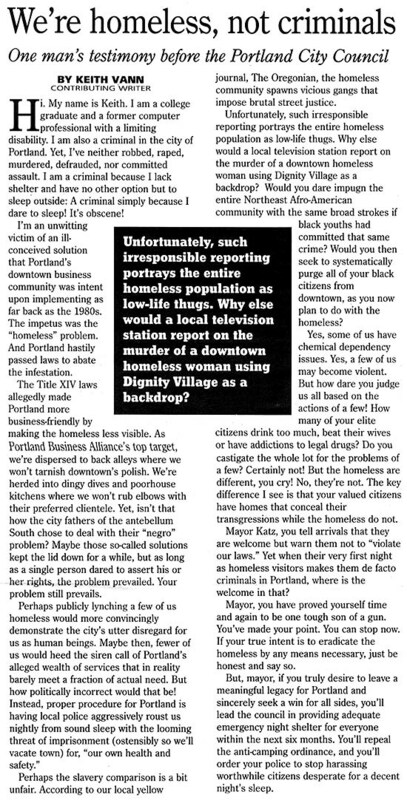 Mayor Katz Doesn't Care", by Phil Busse in the Feb 28, 2002 issue of the Portland Mercury. Dignity Village - New Oregon Trail? If Oregonian's and others are right, the future really does belongs to... REAL EVERYDAY PEOPLE. Street-dwellers create an independent, self-goverened camp in Oregon, and they want to make it permanent. Dignity supporter John Hubbird throws a little light on the current situation. The New York Times Magazine interviews Dignity residents Chris and Bean. A private donation allows the extended use of the current site near the airport. What happened to Eugene's tent city a long time ago. Dignity supporter, John Hubbird, responds to the Oregonian's October 27th editorial. I wish I could wave some sort of a magic wand so that you might realize that Dignity Village residents are "good guys" -- part of the solution to people experiencing homelessness, not the problem! Dignity Village works because of its organizing methodology. That the powers-that-be dislike us proves only our effectiveness. 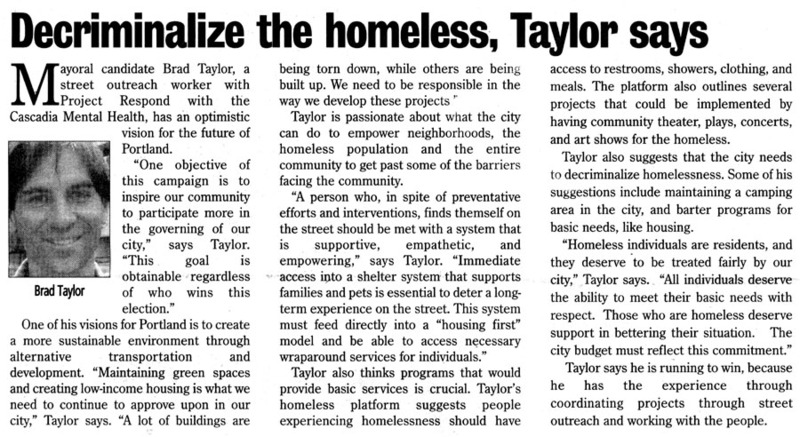 Few (cared) about the homeless until the homeless organized themselves, educated themselves and formed a community. The City of Portland once again pulled off an 11th-hour peace treaty with the residents of Dignity Village, which allows the tent city to stay at Sunderland Yard, a city-owned 7-acre parcel near PDX, for up to six months. Dignity Village, the tent city next to Portland International Airport, will be allowed to stay put for six more months after a local philanthropist agreed to pick up the tab. Dignity Village, the tent city comprised of homeless people, will be allowed to stay near the Portland International Airport for six more months after a local man agreed to pay the city about $20,000 to cover the cost of moving its leaf-composting program. The city has required that the residents of Dignity Village move from their current home on Sunderland Road as of Nov. 1 to make room for a new tenant -- the fall foliage. For the past six weeks, Portland's fascinating experiment in creating a society from scratch has gathered itself into an important new architectural and political form. 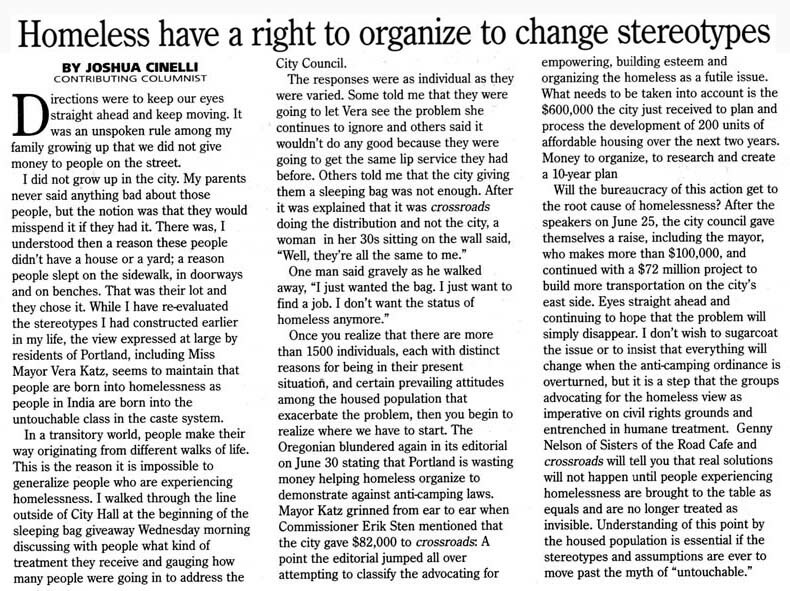 The latest edition of the Oregonian's editorial smear campaign against Dignity Village. Residents of the Creston-Kenilworth neighborhood spoke out loudly this week against the camp moving into a vacant parcel in the 3000 block just south of Powell Boulevard. 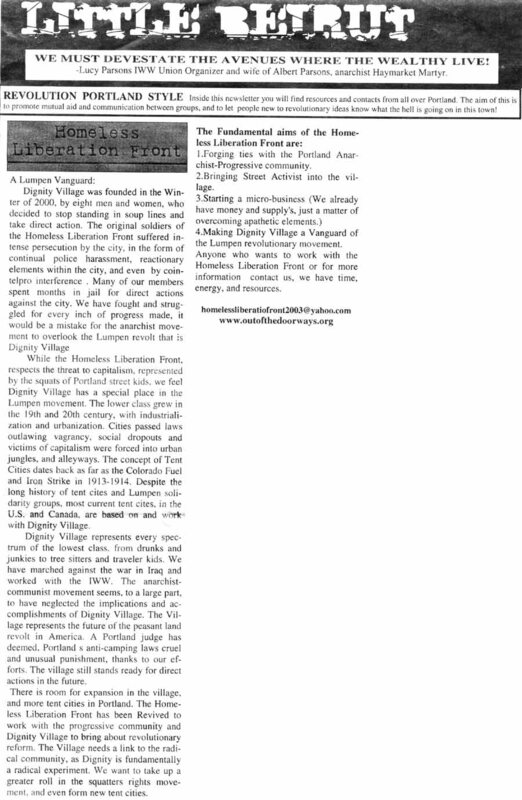 A history of Dignity Village by the Portland Surrealist Group. The city's 20-year-old anti-camping ordinance remains in limbo following the recent dismissal of an appeal of a court decision that ruled the ordinance unconstitutional. When the homeless encampment known as Dignity Village was ostracized in late August from its site underneath the Fremont Bridge, most observers believed that would be the whimpering conclusion to the eight-month attempt at establishing a camp for the city's homeless--run exclusively by the homeless. Last week's showdown reveals that there's a good reason they didn't call it Unity Village. 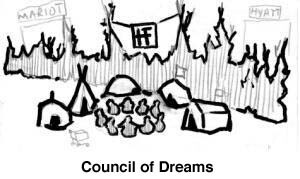 John Hubbird gives a fresh perspective on the decisions villagers had to make on September 5th. A small group of former Dignity Village activists has set up tents and protest signs on public property overlooking RiverPlace in Southwest Portland in what the activists call an ongoing protest of the city's approach to homelessness. 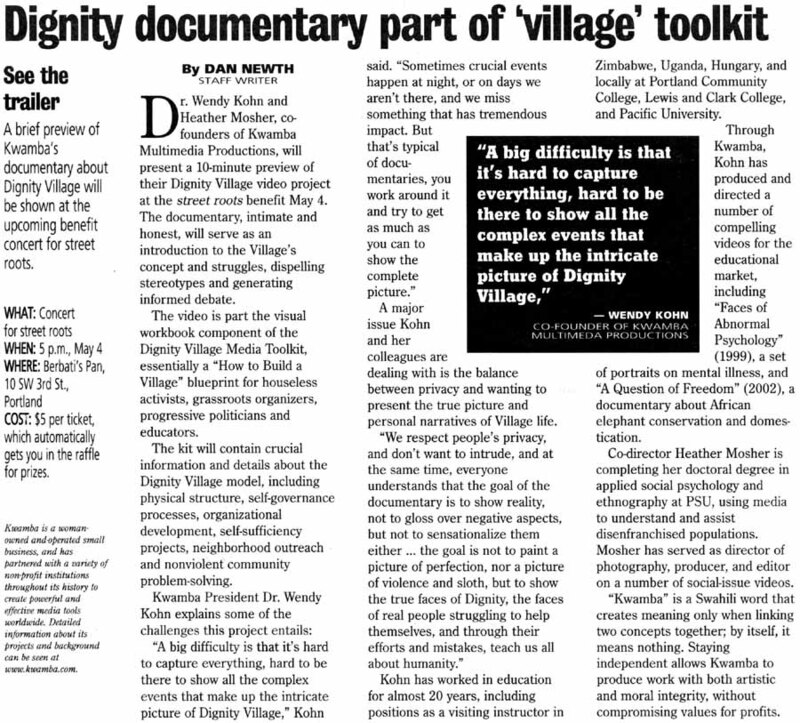 Dignity Village receives coverage in the New York Times. Dignity Village residents and volunteers will gather Sunday morning to hold a work party to make improvements on the new tent city in Northeast Portland. Most of Dignity Village's residents cleared out from a state-owned piece of land in Northwest Portland on Wednesday, avoiding a confrontation with authorities and ending a standoff with city officials. Those who run Portland's homeless shelters acknowledge the facilities aren't perfect. But they also question assertions made by some residents of Dignity Village that the shelters are dirty, overly restrictive and not geared to the needs of the homeless community. After last-minute negotiations and a fragile truce with City Hall, the men and women of Dignity Village trashed a cut-rate deal to relocate their makeshift camp. It's time for Dignity Village to break camp -- and members of the Portland City Council should help roll up the sleeping bags. I was both saddened and offended by Christopher J. Babin's Aug. 28 letter opposing Dignity Village ("No dignity in this behavior"). Police have arrived at Dignity Village. They told residents that they must vacate the site by noon Wednesday, which is a 24-hour extension of the last deadline given by the city. Anyone still there at that time will be subject to arrest and all possessions subject to seizure. With the threat of police sweeps looming, Dignity Village residents said Monday they wouldn't move to city-owned land near Portland International Airport because of the site's fencing and its distance from a grocery store and other services. There is a certain nomadic and pioneering spirit that needs to be admired when people choose to work and live outside of society's given options. 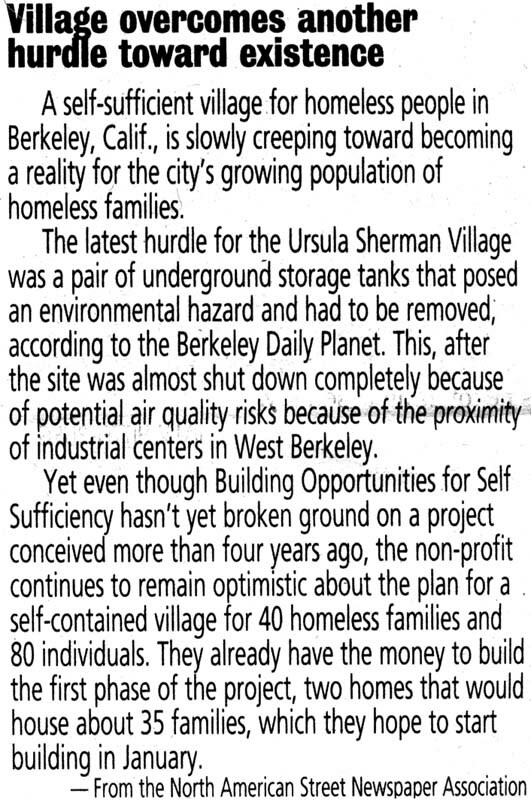 Apparently, the city has no time to work with the self-organized residents of the Dignity Village experiment . . . However, the city has all the time in the world and $35 million to work with the wealthy investors of Portland Family Entertainment. Oregonian columnist Steve Duin suggests if you are "outraged Dignity Village doesn't conform to the tedious zoning and building requirements that control so much of the action in Northwest Portland. And they are convinced these squatters prefer autonomy to low-income housing . . . you may want to get off that fat seat cushion and wander out to the village before it's dismantled." Portland's City Council agreed Thursday to take a first step toward officially endorsing the Dignity Village tent city for the long-term, while village residents reluctantly agreed to move to a city-mandated temporary site that village supporters described as a "concentration camp" and a prison. Leaders of the homeless tent camp, Dignity Village, aren't thrilled with the new location that the city is offering them in Northeast Portland, and you can see why. Let's just say it's in no danger of being featured on Sunset magazine's next list of hidden camping gems. Portland city leaders said Tuesday they want Dignity Village, a tent city for the homeless, to move to a site near Portland International Airport's runways for 60 days. When it comes to providing housing in downtown Portland for the poor, the city's goals are modest: to have "no net loss" of apartments affordable to the lowest-income families, even as the number of middle- and upper-income housing units increases. Members of the Dignity Village tent city have agreed to move from their current encampment in Northwest Portland next week and will begin breaking up communal kitchens and other facilities on Sunday. Supporters of Dignity Village packed into the Sisters of the Road Cafe on Tuesday afternoon to pledge time, money and political energy in an effort to find a permanent site for the tent community. The Oregonian's editorial board continues to criticize Dignity and its supporters. 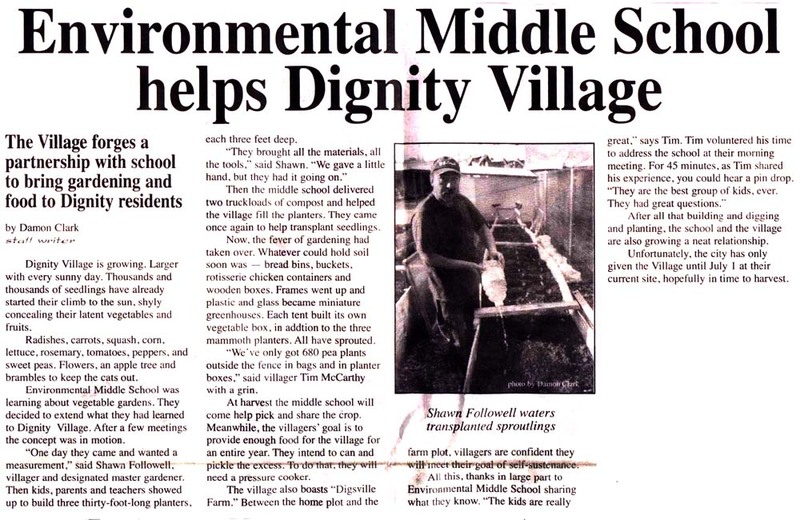 Life and times at Digsville, Dignity Village's co-operative farm, by Street Root's Jay Thiemeyer. Street Roots' Jerry Martin interviews four women from Dignity Village. Street Roots' Jerry Martin covers the shift in Portland's policy on Dignity Village. Miriam Knight editorializes about Dignity Village's need for private land in the Community Connection. Village supporters respond to the Oregonians July editorial assault, by Orion Gray and Jamie Manuel. Pete Lewis writes about Dignity's past and present in an article taken from Clamor magazine. Richard Hake talks with supporter John Hubbird and villager Jack Tafari on WNYC's On The Line. The Oregonian's editorial staff expresses concern for the unspecified rights of Dignity Village's neighbors. Courtney Sherwood of the Portland Mercury writes about Digsville, Dignity Village's farm. 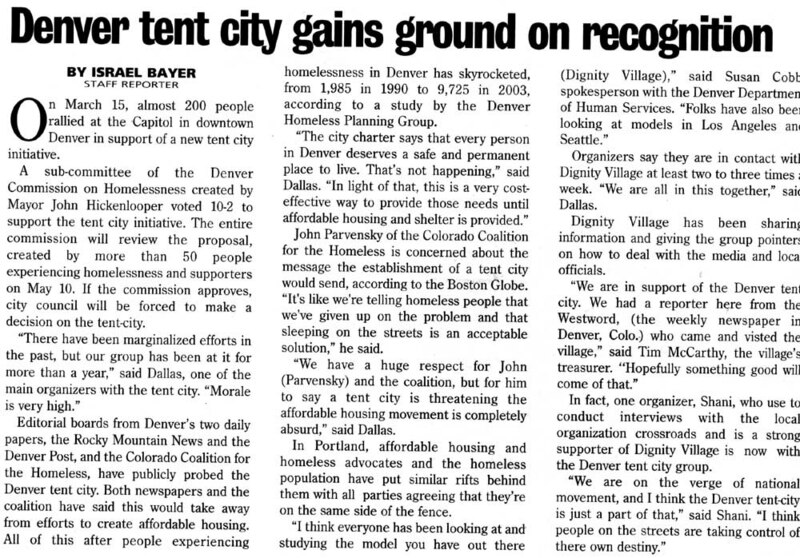 The City is working with the tent city's leaders to find a way to let otherwise homeless campers use public land for as long as a year . Part I, with Cheif Kroeker, is not available. city to stay on public land for as long as a year will be discussed today, when village leaders meet with Police Bureau officials. The Oregonian talks to residents about Dignity Village. 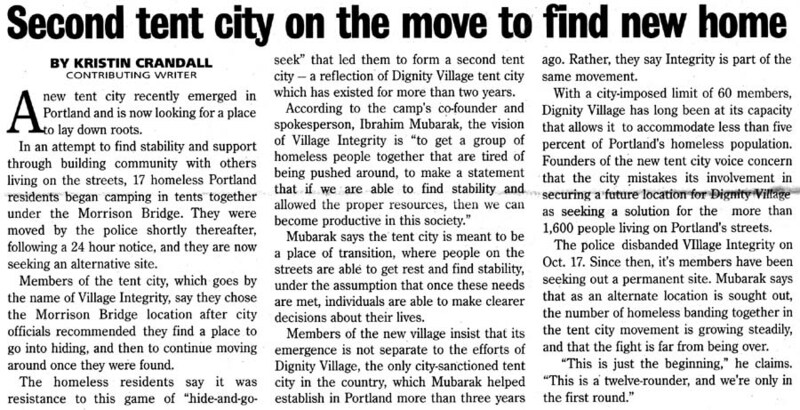 "Dignity Village has proved itself and deserves a future in Portland ", says the Oregonian. City Hall seeks end to Dignity Village Dignity makes front page of Street Roots. Jack Tafari says a few words about the death of Kevin Hull in the June issue of street roots. Oregonian article on the choices Dignity faces with the July 1 closure threat. JP Cupp free at last! Dignity residents request reconsideration of the proposed dissolution of Dignity. The Oregonian reports Dignity Village must move from public land by July 1st. Portland Indie Media reports on "Teach In" announcement, along with running commentary. Adam Holdorf's article about Dignity Village Experiences and opinion originally published in Real Change News. Mayor of Dignity Village gets best housing deal in town. The candidates for the county's top job both want to secure a permanent site for Dignity Village in downtown in Legislature, the Oregonian reports. 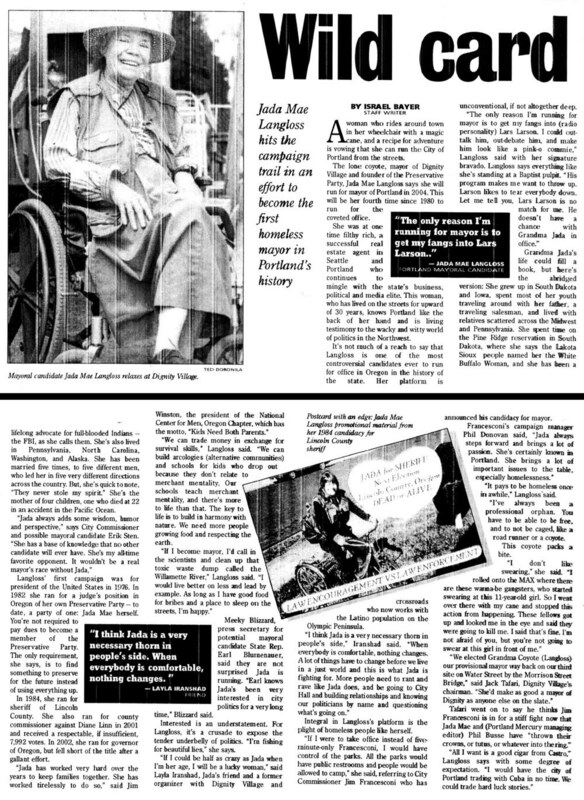 Willamette Week reports, local chapter of the War Resisters League plan to give about $5,000 to Dignity Village. John Hubbird writes in response to Willamtte Week Article: "Return to Dignity." 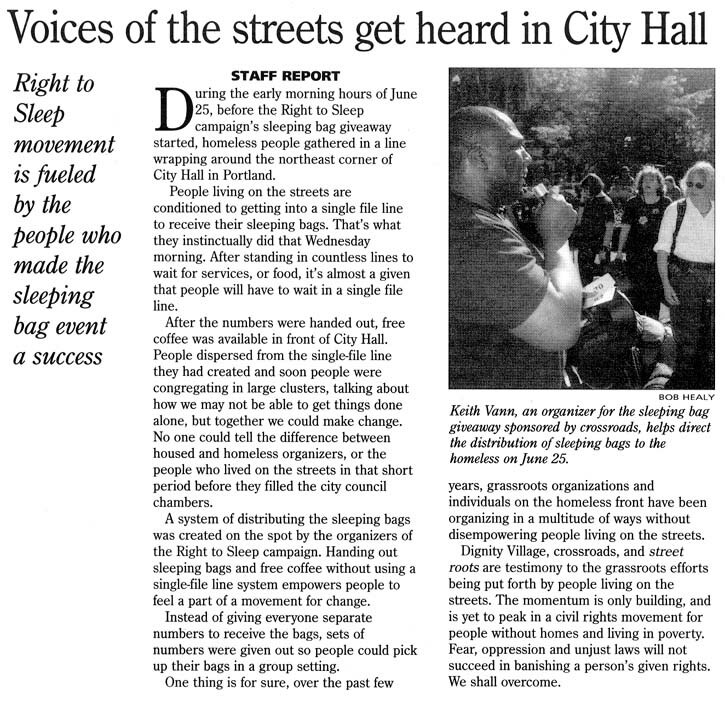 Street Roots reports, organization of Dignity Village residents inspires respect in the community. The Oregonian reports, Dignity Village organizers hope to relocate the tent camp to private land and end frequent moves. 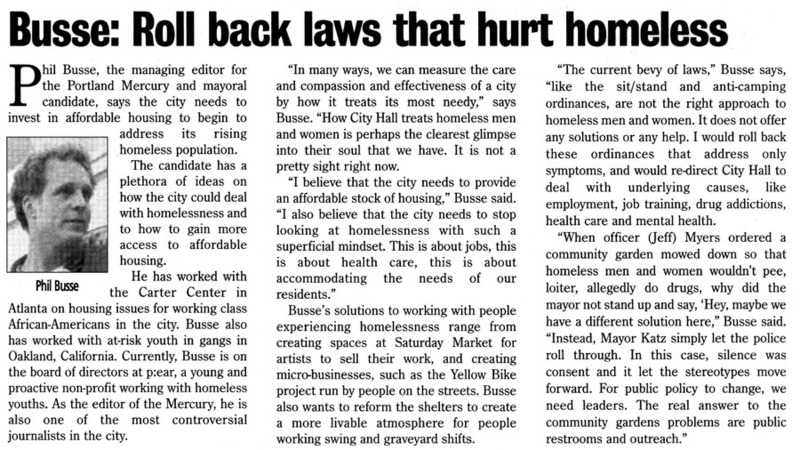 From the Portland Mercury, including a nomination for Dignity Village. A letter to the editor of the Willamette Week. A letter to the editor of the Portland Tribune. A Photo Essay Documenting Portland's Homeless (in the Portland Mercury). Campers see an outpouring of support. 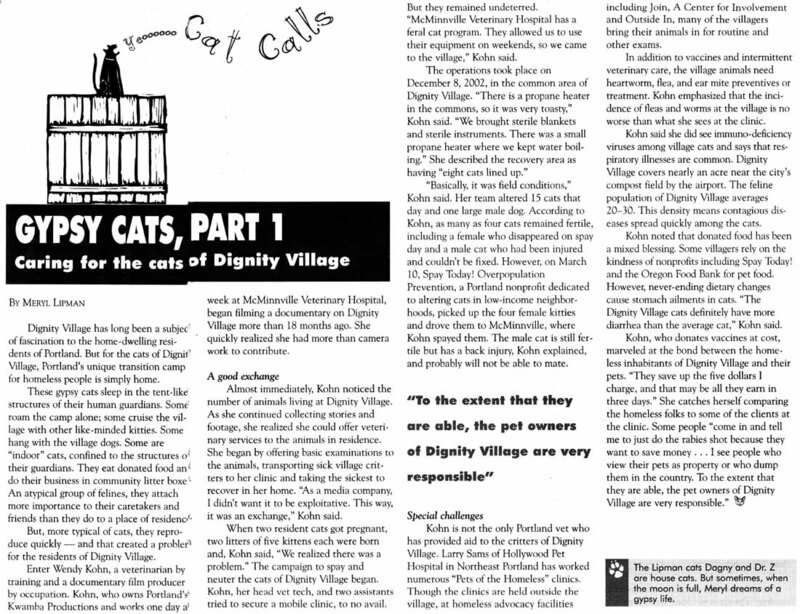 Coverage of Dignity Village by Portland Indie Media, with running commentary. 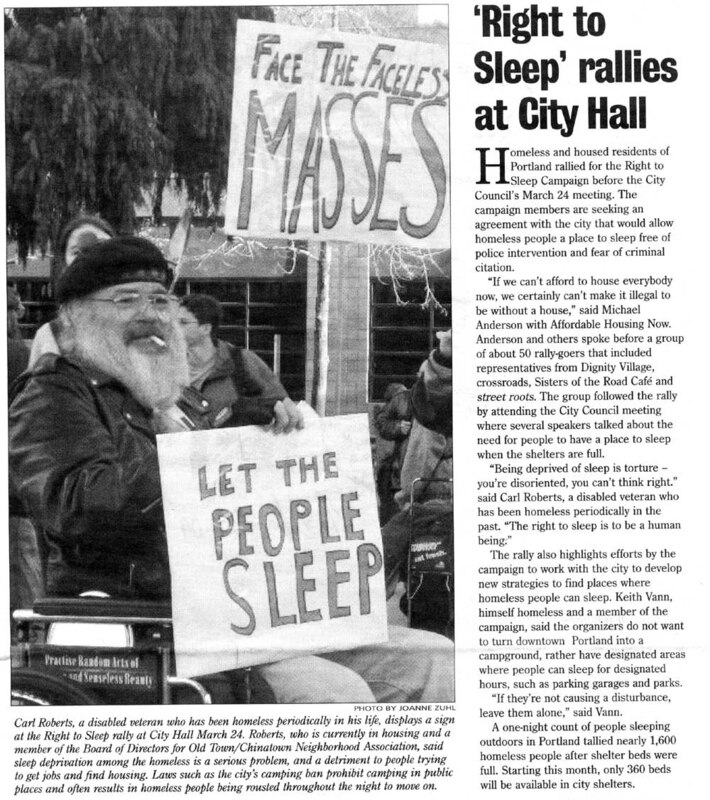 Letter to The Oregonian (1/27/2001) asks: The homeless tent camp fills a need, beds for people who need them, at no cost to the City; so what's the problem and concern here? Know that the kernel of the future lies buried in the present. Portland Police continue to enforce the camping ban despite a circuit court ruling finding it unconstitutional. Decision made on Sept 27, 2000 by Multnomah County Judge Steven Gallagher who ruled unconstitutional Portland's nineteen-year-old camping ban. Plenty people 'ave a housin' prablem inna Portland.